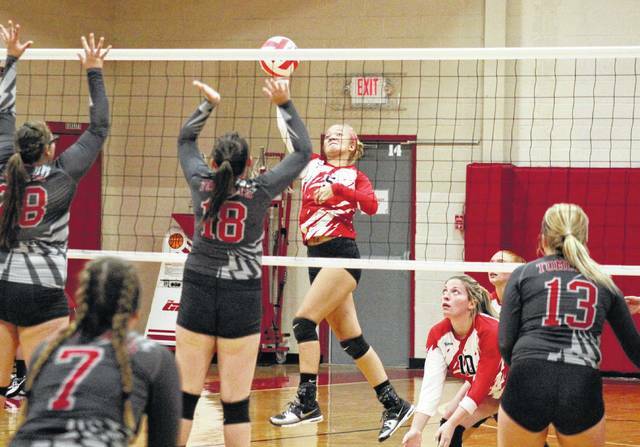 MASON, W.Va. — It wasn’t exactly the start to league play that the Lady Falcons had dreamed about. 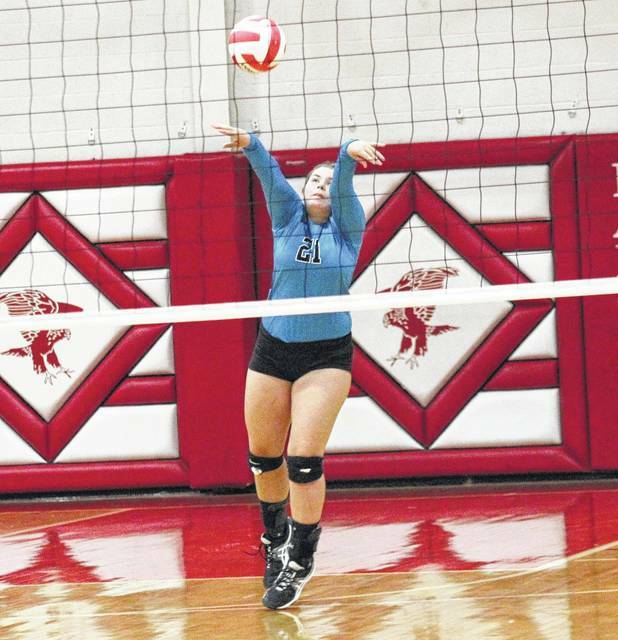 The Wahama volleyball team dropped a straight games decision to visiting Trimble, in the Lady Falcons’ first Tri-Valley Conference Hocking Division match of 2017 on Wednesday evening at Gary Clark Court. The Lady Falcons (1-1, 0-1 TVC Hocking) led early in the opening game, but surrendered eight straight points to the Lady Tomcats. Trimble led for the remainder of the first game, eventually winning by a 25-14 margin. Wahama also led briefly at the beginning of the second game, before the guests pulled away to the 25-12 win. The Lady Falcons led by two points early in the third game, but Trimble gained the advantage at 6-5 and never trailed again. The Lady Tomcats won the finale by a 25-11 count, sealing the 3-0 sweep. 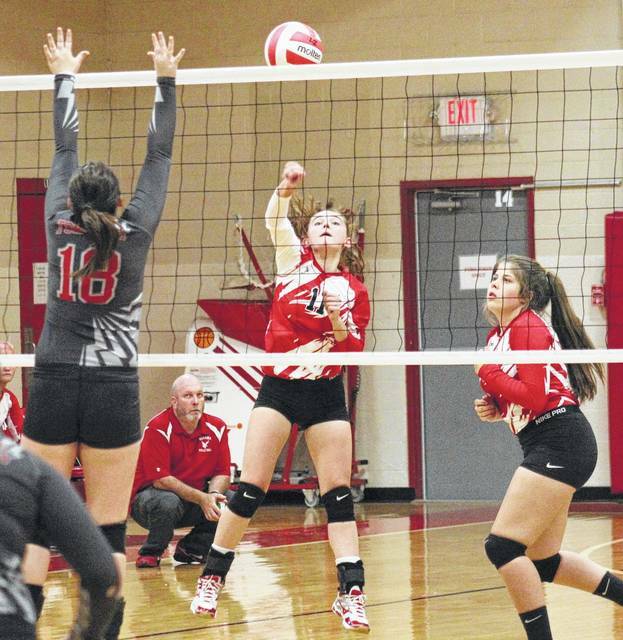 “We didn’t play the way that we need to play,” Wahama head coach Matt VanMeter said. “We had a lot of silly mistakes and mental errors. If we can overcome some of those, make that first pass and come up with some more down-balls, then we’ll be able to compete in the TVC a little bit more than we have in the past. 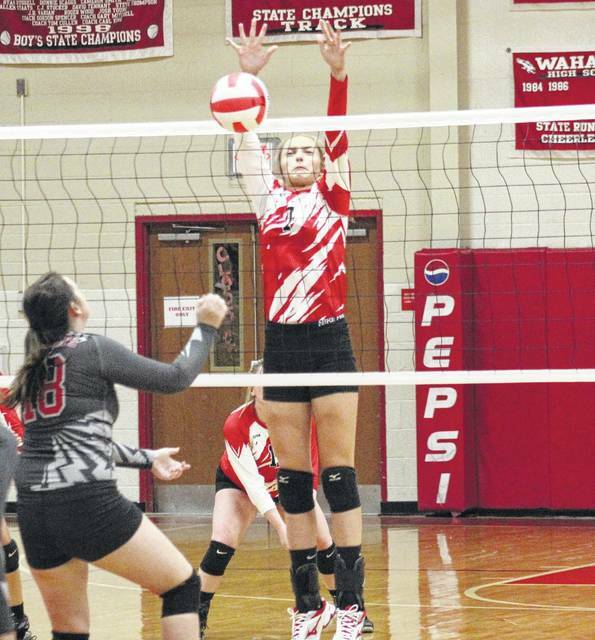 Wahama’s service attack was led by seniors Madison VanMeter and Elizabeth Mullins with four points apiece. Harley Roush was next with three points, followed by Victoria VanMatre with two. Gracie VanMeter and Hannah Billups both finished with one point in the setback. Sydney Hardy and Macinsey Cooper led Trimble with 15 service points apiece. Skylar Moore had seven points for the victors, Tayla Lackey added five, while Kaitlyn Spears finished with four. Baylee Hardy rounded out the THS service attack with three points. The Lady Falcons and Lady Tomcats will clash again on Sept. 26 in Glouster. After a trip to Federal Hocking on Thursday, Wahama will be back at home on Monday against Belpre. Wahama sophomore Gracie VanMeter (5) spikes the ball over the net in front of teammate Madison VanMeter (10), during the Lady Falcons’ loss to Trimble, on Wednesday in Mason.